Alisson has been preparing for the physical nature of the Premier League by using rugby tackle bags in Liverpool's training sessions. 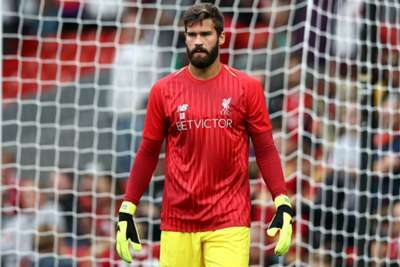 Liverpool boss Jurgen Klopp is eager for Alisson, who joined from Roma for a fee that could rise to £65million, to become familiar with the challenges English football presents. The club's goalkeeper coach John Achterberg has utilised rugby equipment during training in an attempt to recreate scenarios the Brazilian may face in the division, while there has been a specific focus on set-piece situations too. "It is not rugby, it is goalkeeper training," Klopp explained to reporters. "When Loris [Karius] came he did it and, of course, Alisson is doing it as well. It is normal goalkeeper training. "It makes sense to do it because the six-yard area is not a safety box for a goalkeeper. "We have these situations in training constantly when we do set-pieces and the box is full with 22 players - maybe 22 is a bit much, but certainly 15. "It is not that the goalkeeper has to change completely for this league. We have to help him too in situations. "There is not just one player responsible for something – we have to have the right formation around set-pieces. It is not solely about Alisson but the whole team."